This versatile, compact and powerful machine is all you need to take you to the outdoors. 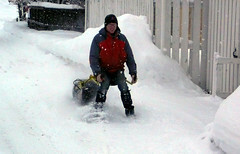 Designed originally for ski patrol use, the SKIZEE is rugged and safe. Testing it here in Kimberley, it has been used on logging roads and in the bush west of Kimberley this winter, works really well and is great fun - sells for $2500.